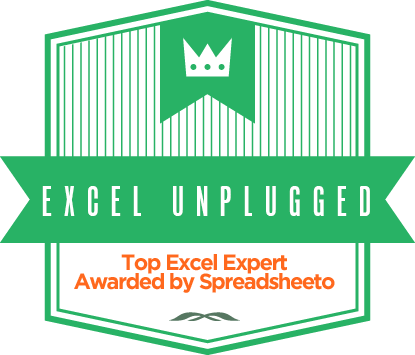 There are many more or less unknown tools in Excel. One of those is definitely the Camera Tool. Imagine the following scenario. You have two sheets in Excel. On one Sheet you have all the data, and on the other, all the calculations or a chart based on that data. Now we wish to be able to see what impact does changing the data have on our calculations or a chart (which are on another Sheet). 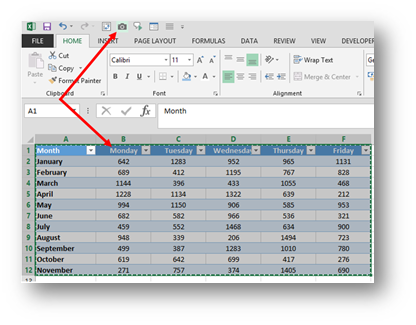 One way to do this is to implement a Watch Window which is very rigid and Excel 2003 looking. But there’s another way. 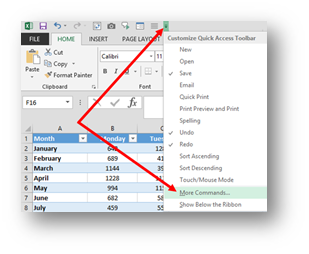 Take a photo of the desired area with the camera tool and place that photo anywhere in Excel (another Worksheet or even another Workbook). And now you have a surveillance camera that dynamically shows you what is happening to that area. Here’s how you find it and work with it. You can’t find the Camera Tool on any of the Ribbons, so you have to add it to your QAT – Quick Access Toolbar. Here’s how. Now the Camera Tool should reside in your QAT. Now to use it, you must first select the Range of Cells that you want to keep an eye on and then select the Camera Tool. You will get the famous army of ants walking around the selected area and that means that the Camera Tool will now create a copy of this area wherever you choose. Now you place yourself in the area where you need the picture to be and just draw it out by clicking & dragging. As soon as you draw out the area, the picture appears. And now it’s like having a surveillance monitor where you will dynamically see the changes made to that area live! Great fun and sometimes a very useful tool to know. And once again, we are one step closer to eternal happiness. It is an excellent tool when you need to do Dashboards or Reports. There are several ways to use it such as: graphics, flags, etc. Good tip! 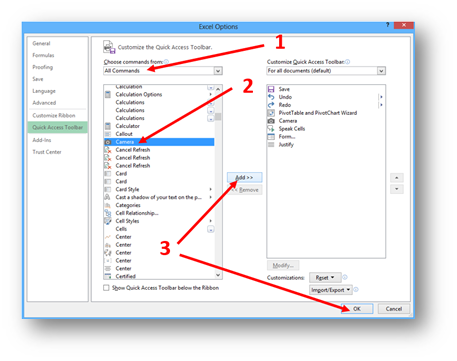 On top of putting the icon on QAT, you may also copy and paste linked picture. I find this is more convenient. Wow, that is very cool and will be very useful. Thanks for sharing!